Sheffield United manager Neil Warnock says he has no sympathy for Paddy Kenny after the goalkeeper had his eyebrow bitten off in a fight. The 28-year-old was involved in a brawl in Halifax on Monday. Warnock told BBC Radio Five Live: "He's let himself down and I think he's more embarrassed about it than anything else. This should have been avoided. "The lads have got to learn that wherever you are when you're a Premiership footballer, you're news." Warnock, whose side take on Premiership leaders Manchester United at Bramall Lane on Saturday, added: "I've told Paddy in the past he shouldn't be going out in Halifax. "All of a sudden he's back out and it isn't a coincidence. He's let himself down. "He won't be going out in Halifax again. He knows he's let me down, but things happen with young lads like that." 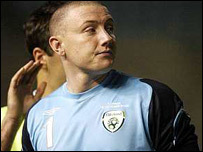 Republic of Ireland keeper Kenny is often the subject of jibes about his weight from rival fans and Warnock joked: "He takes a lot of pressure off me because of the chants he gets during a game. "You asked is he big enough, I think the answer to that would be yes!"